Today we visited “Eritrean roundabout”, so called because the woods next to it are home to hundreds of Eritrean refugees. They were, without doubt, some of the most welcoming and friendly people I’ve ever met. Every single person I spoke to shook my hand, even if they were just saying hi. 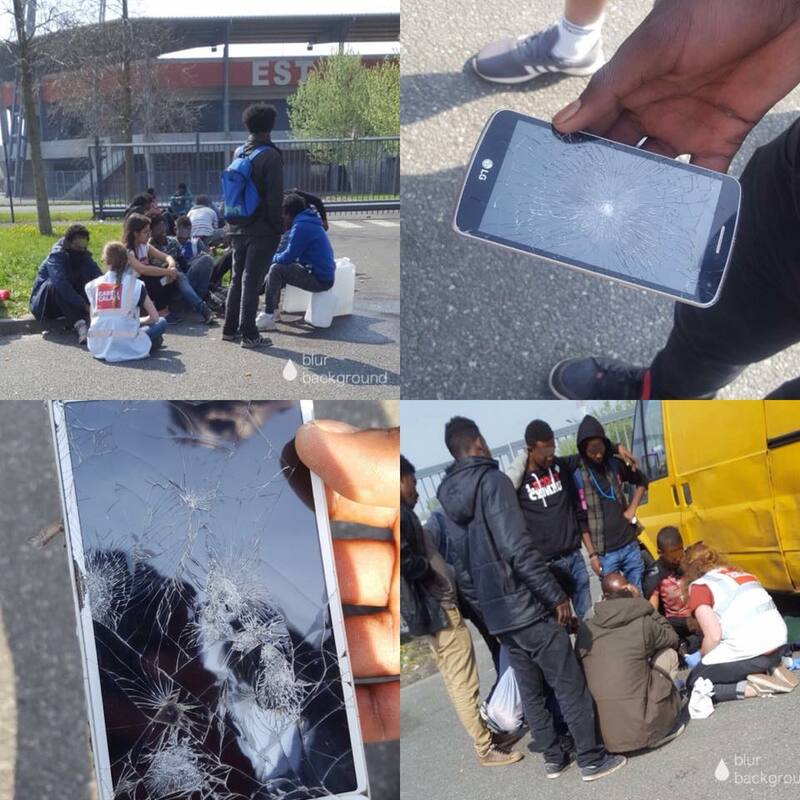 While we were there, dozens of them told us about CRS police taking mobile phones from refugees and smashing them to pieces in front of them for no reason whatsoever. This didn’t come as much of a surprise. I’d heard that the CRS routinely destroy refugees’ makeshift camps, pepper spraying both them and their tents and sleeping bags, making them completely unusable. I’d been told that, on occasions, operations like this had even been planned to coincide with food distributions carried out by the French State, luring refugees away from their homes and possessions and destroying them while they are gone. I’d heard that police even take their shoes, and that all the above happens at such a rate that charities struggle to meet the constant demand for new shoes and tents. Yet, what really got me was the phones and the sheer cruelty and pointlessness of it all. Many people asked if we had any donated phones and showed me their smashed phone screens or phones with huge dents from police batons. On distributions, Care4Calais always bring a generator, which is connected to a huge piece of ply board with dozens of adaptors fixed to it so that people can charge their phones and power banks. It’s a rather ingenious-looking piece of kit, and it’s absolutely vital because, for refugees, phones truly are a lifeline and the only way to connect with loved ones they haven’t seen for months or years. Most people I know in the UK can’t go an hour without repeatedly checking their phones. Imagine living in a tent for months on end, after having travelled through hell and back to reach a country that goes out of its way to demonstrate that you are not welcome, only to be denied even basic contact with those you left behind. Imagine living in constant fear of everything you own being destroyed. The unbreakable positivity of the people I met today was truly humbling and, as a British citizen, it fills me with both sadness and rage that their suffering is being inflicted in my name.